A popular saying tells us that getting to the top is easy, it’s staying there that’s the hard part. We welcome a new guest blogger from our friends at 88 Brand Partners, Kevin Cahalin, in the third of a series on consumer packaged services. A popular saying tells us that getting to the top is easy, it’s staying there that’s the hard part. That certainly holds true for a consumer packaged good (CPG) entering our home. We might grab the closest roll of paper towels (easy) and find out later that their absorbent qualities are, well, leaky at best. And the next family trip to Target results in a new brand replacing it on the shelf, proving that staying on top—in the pantry, at least—is pretty hard. Consumer packaged goods have to constantly prove their worth to us. Consumer Packaged Services (CPS), on the other hand, are more of a sure thing—a toothbrush, underwear, a razor—arriving at intervals of our own choosing. We’ve invited them in, made them as much a part of our homes as the flat screen or the faulty smoke alarm. But these services are businesses, and, like any business worth its salt, they want more of our money. But how to go about doing that? CPS brands are, by definition, not vying for space or attention in a store. And they’ve worked so hard to convince us of their effectiveness, trustworthiness, their overall value, that to go full-on CPG and start trying to sell, sell, sell would be a danger. Yet, at the same time, not doing exactly that is obviously a lost business opportunity. But since CPS brands are built on the efficacy of a single product, they’d be eating their own lunch by offering a line of competing products. This leaves them with one path to larger profit. It’s the art of the upsell. Upselling for CPS brands is not about bettering the product they have (because they already have the best product, and they’re realigning an entire industry to prove it) but about supplementing it to the point where the singular product becomes indispensable when surrounded by an entire suite of add-ons. Though with zero in-store presence, CPS brands have just two spots from which to further push product: 1) their website, and 2) the box already in the consumer’s home. The latter, the more non-traditional of the two spots, has been a boon for creative brands willing to think outside the traditional delivery box. Perhaps the most important thing CPS brands have is a captive consumer, and, beyond that, one who brings with them the passion of a convert. They’re willing to go the extra mile to engage with the brand—in whatever form that may take. And so Dollar Shave Club, knowing where its product box would go, understood it’d have the most captive type of consumer—one in the bathroom. That’s why they’d throw in a copy of The Bathroom Minutes, “A Dollar Shave Club Publication” chock full of grooming tips, health advice, word puzzles and, you guessed it, upselling tactics. It’s here they’ll mention a shaving cream, a shampoo, anything but the razor already in the box. And oftentimes, they might even throw in a sample of any one of those things, to prove that, like their flagship product, their other offerings are every bit as good as others on the market. Samples are something Glossier, the skincare and makeup “movement,” has found particularly effective in, as Inc. puts it, helping the brand “achieve cult status.” It loads each delivery box with a set of stickers as well as samples of upcoming offerings, all meant for easy sharing amongst friends. 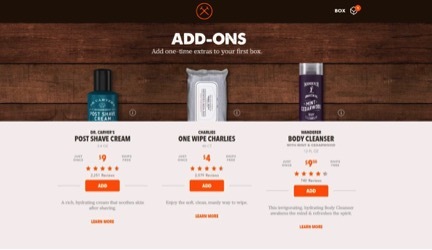 This simple upselling tactic has increased consumer engagement with its products; the brand began with four cornerstones, and now offers an astonishing range of body lotions and even fragrances. Glossier’s efforts to increase brand awareness has awareness have paid dividends, and in an industry worth $445 billion, that awareness is worth an awful lot of money. When meal kit provider Blue Apron ran into a problem that plagues many food services—low margins—they, like so many restaurants, realized that the highest profit margins lie in alcohol sales. That’s when they decided that the secret ingredient to their meals would be… wine. Online, suggested wine pairings are the last thing you see after you’ve decided on your next set of meals. With a low cost point and an easy one-click process, Blue Apron makes it hard to say no to some chardonnay alongside your salmon. And Dollar Shave Club did nearly the exact same thing, leaving the upselling to right before the purchase. And they do it as a friendly reminder, just in case you might’ve forgotten to add something in the first time around. CPS brands, in looking to gain traction in the market, inadvertently backed themselves into a corner. The best among them, though, are figuring out how to make that corner as roomy as possible. They use clever methods to increase brand awareness, build a brand beyond a single product and, most importantly, retain that crucial space on our shelf. Staying on the top is hard to do, but some CPS brands are finding that staying top of mind is the way to do so.